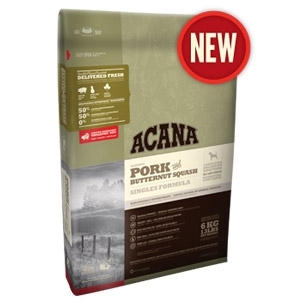 Featuring Alberta pork as the sole animal ingredient, ACANA Pork & Butternut Squash is a Limited Ingredient and Biologically Appropriate™ food that’s perfectly suited to diet-sensitive dogs of all breeds and life stages. Raised locally and delivered fresh, our Alberta pork is featured in nourishing WholePrey™ ratios including meat, liver, kidney and cartilage — all of which supply nutrients in natural form, dramatically reducing the need for synthetic ingredients in our foods. Infusions of freeze-dried pork liver naturally enhance palatability for selective eaters.